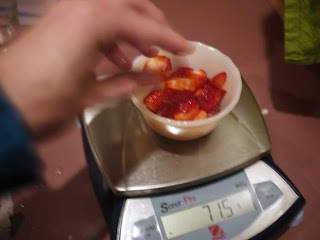 When Calvin was three, a year after he started having seizures, we consulted a neurologist in Boston and started him on a new low glycemic index diet aimed at curbing them. A year later, after little to no improvement in his seizures, we put Calvin on the restrictive Ketogenic diet, a rigorous and exacting high-fat, low-protein and low-carbohydrate diet developed in the 1920’s which is known to eliminate seizures in a small percentage of children who try it. The diet was unpalatable, difficult to digest and nearly impossible for Calvin to engage in—the fun tasty finger foods all but disappeared from his menu. Instead of enjoying cheese puffs and graham crackers, in addition to home-puréed vegetables and minced meats and seafood, Calvin mostly ate mayonnaise, oil, butter and heavy cream with minuscule amounts of protein and even smaller portions of fruits and vegetables. But Calvin was a trooper and he slogged through, greasy meal after greasy meal, while I slogged through weighing each morsel of food to the tenth of a gram, equivalent to about one drop of olive oil. After three years of struggling on these diets, and coinciding with a serious drug withdrawal, Calvin began to refuse everything but Greek yogurt, (mixed with olive oil to comply with the rigid fat to carb ratio.) Calvin, five years old and thirty-five pounds, lost five pounds in a few stressful, seizure-ridden, seemingly endless weeks. Needless to say we were forced to change the course of Calvin’s dietary regime, though it took over a year to get from there to where he is now. His foods are still carefully measured but the big difference is that he enjoys eating and he hasn’t missed a meal in over a year. Not one. Instead of a thimble-sized piece of strawberry, he gets half a cupful. Instead of two large spoonfuls of mayonnaise and a tiny portion of diced chicken he gets several spoonfuls of diced chicken and one spoonful of mayo. Calvin, having struggled with food, digestion, medicine and seizures for most of his life, still barely registers on the growth chart. But that’s Calvin, my one and only little Peanut, and he loves to eat. Now if we could just get him to stop chewing the furniture and eating his shoes.